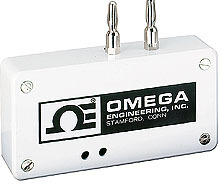 The OMEGA™ TAC-386 can turn any chart recorder or voltmeter into an accurate temperature measuring instrument. The TAC-386 is a universal thermocouple amplifier and linearizer which provides a precision 1 mV/°C or °F for J, K, or T thermocouples. Cold junction compensation is standard. Nota: Unit includes transition adaptor (TAS), complete operator’s manual and beaded wire thermocouple with subminiature connector.